The top flooring trends of 2018 are all about offering products that give architects and designers the ability to play with different textures, patterns, colours and shapes to create inspiring floors. Van Dyck Floors’ says that the carpet industry is favouring designs in shades either of grey and natural colours or with touches of bold and bright colours, or a combination of both. To respond to the evolving trends in interior design, Van Dyck Floors’ already broad product range has been extended with some new introductions such as Neon, Maestro Collection, Optimum Collection and Titanium Collection. Glow and Design Shapes also respond to new demands of designers who are looking for more variety in terms of shapes and colours. Glow is inspired by bold colours that make a statement and is available in ten bright and two neutral colours that encapsulate a youthful and vibrant look. If you want to create a one-of-a-kind floor design, then Design Shapes is the range that will help you achieve your goal. Besides being available on most of the existing Van Dyck Floors products, it is also available in plank forms of 100x25cm or 50x25cm, or alternatively in Triangles (90º) or Hexagons (6 sides). Standard sizes of 50x50cm remain available and other square sizes such as 60X60cm and 100x100cm tiles can still be manufactured on request. 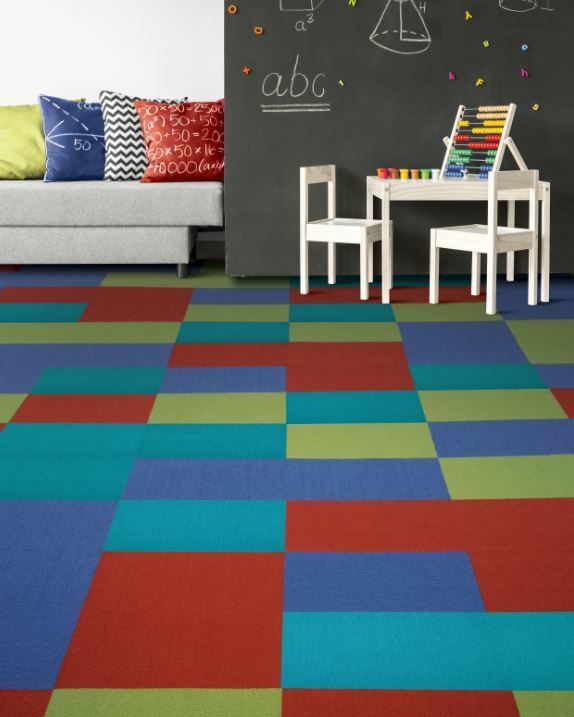 Carpet tiles are arguably one of the most versatile flooring products thanks to the ability to mix and match colours and textures for specific decors. The tiles can also be laid in various directions (monolithic, tessellated, ashlar, brick-bond or random), which can create different patterns and effects. The new product ranges, coupled with the wide variety of ranges from the company, means there is something available for any customised style or taste. Both Glow and Design Shapes are available in an Enduroback modified recycled bitumen backing, and are most suitable for heavy commercial environments. The bitumen that the company uses consists of more than 40% recycled material and because of their lasting durability, can be re-used for the secondary market at the end of their lifespan. This bitumen backing also contains no PVC’s, is very low on VOC’s and is highly durable, therefore increasing the longevity of the carpet tile. Van Dyck Floors is proud of having an ISO 14001 certificate, which has strengthened their commitment to environmental practices. They are also Carbon Trust certified and have reduced their carbon footprint by more than 40% over the last 4 years.